I didn’t grow up in adventurous household so it has taken me many years to get to the point where taking a leap into the unknown is a comfortable feeling. So when we randomly picked Portugal on the map and booked a trip, it was a bit nerve wracking to think of all the things we didn’t know: the language, the culture, the food, etc. Yikes. It turns out that Lisbon was more welcoming than we had imagined, even though it’s very much behind in dealing with tourists when compared to more worldly cities like Paris. Our flight was on SATA, one of Portugal’s low-cost airlines, and what we thought was a direct flight to Lisbon Airport. It’s not on the itinerary, but travelers on SATA from Boston to Lisbon will land on an island in the Azores (Ponta Delgada) and wait for two hours before you get to Lisbon. Thankfully, customs at the Lisbon airport is a breeze once you get there. There were no forms to fill out and no line at passport control. Once you are off the plane, it’s an easy walk through the customs process and you are on your way. Tip: The airport is a great time to get a sim card for your phone. The Vodafone kiosk is outside of customs and they offer quick service to get a new sim card. The cost was €12,50 for 4GB of data for a week. It’s worth it. We used Google Maps many, many times to find our way around the city and couldn’t have done that without connectivity. Viva Viagem or Lisboa (Lisbon) Card? The one confusing aspect about getting around Lisbon was the choice between the Viva Viagem card or the Lisboa Card. Guidebooks and travel sites didn’t really have a head-to-head comparison of the two; both were offered as options without advice on which is better. We ended up using the Viva Viagem card (stored value) after doing some math and looking at our itinerary. We discovered that it would be the best value for us to just use the Viva Viagem card for the metro/public transportation, and pay admission to the sites we actually wanted to see. The Viva Viagem card doesn’t have a time limit like the Lisboa Card. We had a week in the city, so we didn’t feel the need to put ourselves under an artificial deadline to see all the sights. The Lisboa Card bills itself as a 3-in-1 card that covers transportation, some museum admissions, and also acts as a discount card. The card can be bought in time chunks of 24, 48, and 72 hours. This card is a great option if you only have a few days to see Lisbon. It’s easy to buy one card and have your transportation and your museum admissions all rolled into one purchase. Tip: When you read the guidebooks or travel sites, note that an “elevator” is both a tram and can be an actual elevator. Santa Justa is the only vertical lift in the city – the other elevators you read about are actually trams. 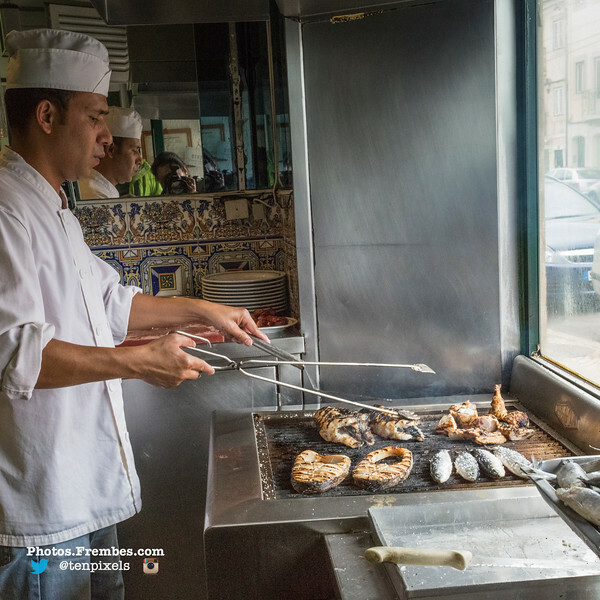 Eating in Lisbon is relatively cheap. There are cafes everywhere but beware that lunch ends around 3pm and dinner doesn’t start until 7pm. My husband and I don’t always eat at the prescribed lunch and dinner hours, especially when we travel, and we were caught out several times when we were looking for a really late lunch/early dinner. There’s also a custom that restaurants in Portugal will bring appetizers to your table without asking. It’s ok to say no to something you didn’t order. Nothing on the table is free, even the bread, but it’s usually not expensive – just a few euros. But keep in mind that it’s yours and you will pay for it if you don’t send it back. 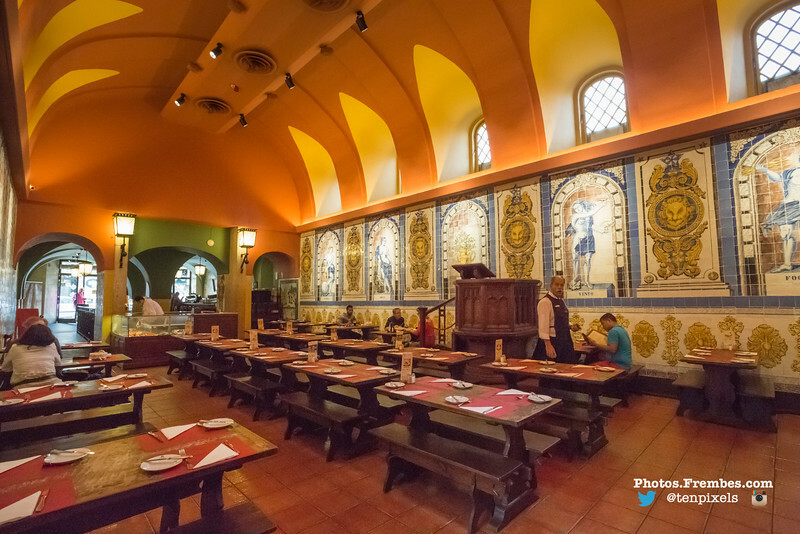 Cervejaria Trindade (above) serves a great Sao Bras style codfish dish (photo below) in Lisbon’s oldest beer hall. 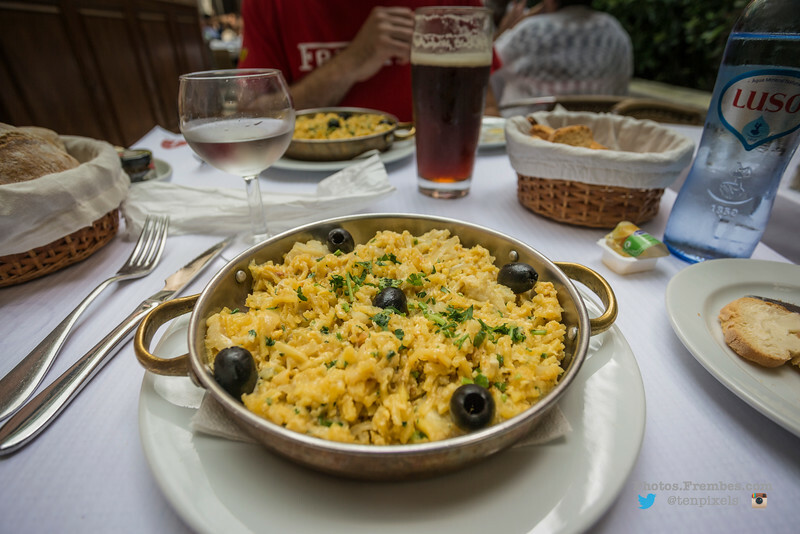 This dish is a staple in traditional Portuguese cuisine and features shredded cod, potatoes, and onions in one bowl. So delicious! The storefront isn’t elaborate and you could walk right by it if you didn’t know to look for it, but the interior is beautiful. It’s worth the stop for a meal or even just a drink. 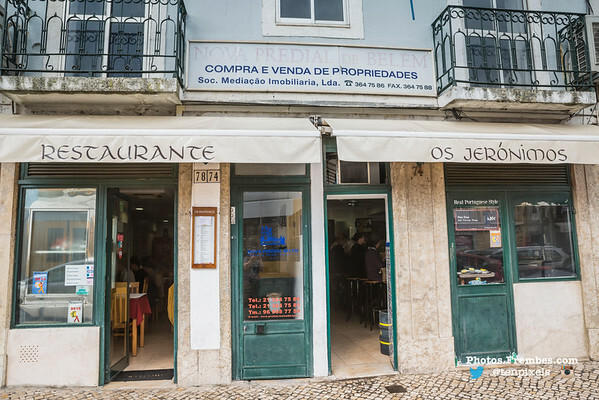 Jardim das Cerejas (no photo) is a no-nonsense vegan restaurant located not too far off the beaten path in Baixa-Chiado. It’s not fancy, but it’s a great find in a city whose cuisine centers on meat. We aren’t vegans, but we also don’t enjoy finding surprise meat in a dishes that normally don’t have meat as an ingredient. Here, we could eat without needing to pick through every dish. 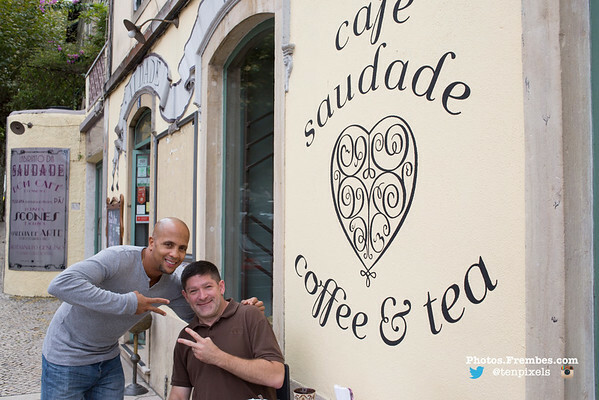 If you find yourself heading to Sintra for a day trip, check out Cafe Saudade on Av. Doutor Miguel Bombarda. The cafe has great coffee and snacks/food, and is located right around the corner from the train station. 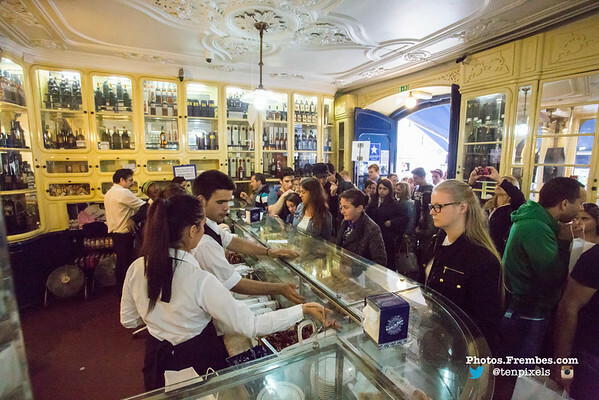 There are a few two-tops outside so it’s a great spot to sit and watch the crowds of people stream into Sintra as you enjoy a coffee and a scone. 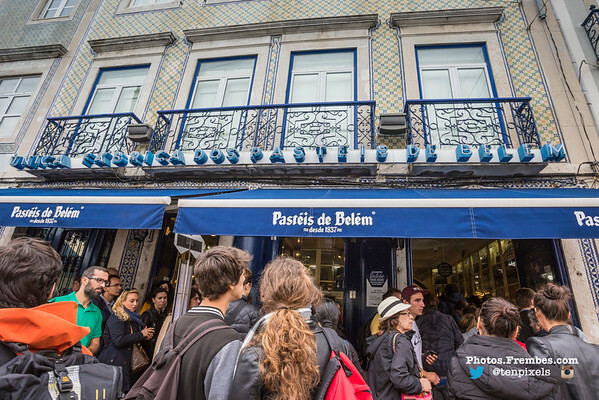 In Belém, an absolute must-stop is Pastéis de Belém, the pastry shop that is the birthplace of the custard tart served all over Portugal. The tarts are served warm out of the oven and they are amazing. As you can see from my Instagram video, the shop is a constant madhouse of people seeking custard tarts. Tip: Tipping on your meal isn’t common since waitstaff are paid a standard, living wage. Guidebooks will tell you to only tip if you receive outstanding service; even then, ten percent is considered a lot. See my next post about places to go and things to see in Lisbon. Next Next post: Welcome home, Brooke!